Learn German in Berlin at our partner German school, GLS. Found in the centre of Berlin, just 15 minutes from the Alexanderplazt and the popular Prenzlauer Berg district GLS is housed in 5 large buildings which have excellent facilities for German language students. Furthermore, GLS has excellent accommodation facilities with more than 50 stylish apartments available for it\'s students. Guided tours of the historical centre. Alternatively many students enjoy exploring the city on their own or in the company of friends or housemates as the city has so many attractions on offer. The intensive German course in Berlin consists of 20 weekly language lessons in classes with a maximum of 12 people. Another possibility is to take the course with 25 lessons which consists of 20 lessons per week + 2 workshops of 2.5 lessons on Tuesday and Thursday | max. 12 students per group. When staying in a host family, you can have dinner at the school residence. When you make the booking, please let us know if you want to book this option. It will apply for the whole stay. Cleaning costs (€ 30) are non-refundable and need to be paid for stays from 1 week or more. The amount is valid for stays up to 1 month; for stays longer than 1 month, the cleaning fee needs to be paid again at the beginning of each new month. Breakfast (and any other meals, if booked) will be served at the restaurant on campus. Airport transfer upon arrival in Berlin: € 60 p.p. In 2019 the school is closed 01/01/2019, 19/04/2019, 22/04/2019, 01/05/2019, 30/05/2019, 10/06/2019, 03/10/2019, 24/12/2019 - 26/12/2019, and 31/12/2019. This exam preparation course takes 4 weeks and finishes with the TestDaF exam in week 5. The course consists of 30 lessones per week. 20 intensive lessons for general German, with a maximum of 12 students and 10 lessons per week for exam preparation in a minigroup of max. 6 students. The preparation course takes place at the school and the exam at the Carl Duisber Centrum Berlin. Student can enrol for the exam once at the school, but during the first days of classes due to the exam enrolment deadline. TestDaF is accepted by German universities (Level C1) and has the same status as DSH. It has several advantages, however: unlike DSH you can try TestDaF more than once and on 4 to 5 dates every year. The prices of the 4 week TestDaF course include 5 weeks of accommodation due to the exam date. The exam fee is not included in the course price. The TELC exam preparation course is suitable for exams A2, B1, B2, and C1 (Hochschule). This specific exam preparation course consists of 2 weeks exam training (in total 36 lessons) in groups of maximum 8 students. Lessons take place in the afternoons (Monday to Friday from, 3 pm - 6.30 pm). The exam is held on the Friday in every second course week, at GLS, and it consists of a written part (2 hours and 20 minutes) and an oral part (15 minutes). Exact starting dates of the TELC course depend on the level you wish to prepare for; course dates are different for A2 - B2 and C1 level. Therefore, always contact us to find out if the chosen starting date matches your level. Starting dates of the TELC course depend on the level you wish to prepare for; course dates are different for A2 - B2 and C1 level. Therefore, always contact us to find out if the chosen starting date matches your level. This course has the same structure as an intensive course but is exclusively for students aged 30+. The maximum of class members is 12 and there will be 20 lessons per week with a minimum stay of one week. The course is offered in 6 levels. The one-to-one German course in Berlin involves private classes with the students choosing specifically what they want to learn. The courses are adapted to the student’s language level. It consists of 20 lessons per week, but if you want to increase the hours please contact us. The commercial German course consists of 30 lessons per week in total of which 20 lessons are general German + 10 lessons commercial German. The commercial German lessons are individual lessons. The course is suitable for participant from all businesses and covers topics you need in all professional fields: the language of negotiations, meetings and presentations, business correspondence, telephoning. You learn how to understand/explain illustrations, diagrams, statistics; how to read/write memos, business letters, reports, brochures in German and how to communicate in discussions and business meetings. These apartments shared with students are located in different neighborhoods in Berlin. Distance to the school is about 25-30 minutes (by tram or walking). You can book either a single room or a double room (with a friend). All apartments are fully equipped, including a shared kitchen and bathroom. Bed sheets and towels are included. The exact location depends on availability and will be confirmed after booking. The apartments in Berlin are an ideal choice to learn German by applying the language in every day situations. Normally you share an apartment with Germans. However it might happen that you are the only student of the language school who is living in the apartment. You might share the apartment with students, workers or a couple with or without children. The accommodation is composed of a single room without meals. However you can book breakfast. Living with a German family in Berlin is a unique opportunity and an ideal way of practicing the language in real-life situations and learning about German family life. A single room with half-board is available (breakfast and dinner). It is also possible to make use of the dinner on offer in the school, although you must decide on an option for the whole duration and this must be made clear when registering. All family residences are within 50 minutes of the school by public transport, taking into account that Berlin is a large and busy city. The school residence in Berlin consists of 50 studio-apartments located on campus. 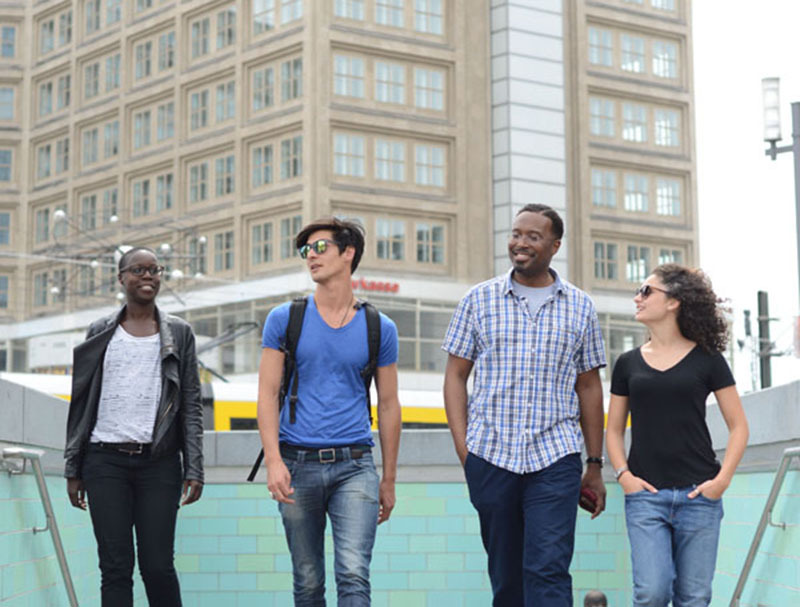 You live in the city centre of Berlin at walking distance from the school amongst international students. Both single and double studio-apartments are fully equipped and have their own kitchen, bathroom, television and free WLAN (you can bring your own laptop). Breakfast is included and is a buffet served in the cafeteria of the language school. If you chose to stay in a double studio-apartmen, you will share with another student. The Premium residence “Stadtbad Oderberger” is located in the school campus, where lessons take place. This top quality accommodation used to be the Berlin’s historic bath. The neorenaissance building has been completely refurbished and converted in a spectacular hotel. The hotel offer beautiful single ensuite rooms with kettle. Towels and bed linen are provided. Breakfast is included and is served in the main school cafeteria. If you prefer have some more privacy instead of sharing an apartment with other students, a studio in residence is a good option. You’ll stay in a fully equipped studio approximately 30 minutes by tram from the school. The studios are located in a 13 story building in a Berlin neighbourhood called "Fennpfuhl", named after the little lake. The tram station is at 5 minutes walking distance from the residence. Every studio is approximately 21 m2, has TV and high-speed internet, a kitchenette, study desk, private shower and toilet, and bed linen and towels are included. There are coin operated washing machines in the basement.